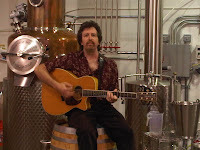 Here's a video filmed way back in November 2010 from our sister series at MyJoogTV which features Scott Harris of Catoctin Creek Distilling Company, the first legal distillery in Loudoun County since prohibition. We discussed the distillation process for organic rye whiskey, social media, government regulation of spirits, and how folk singer Andrew McKnight and the Harris' are kindred spirits regarding the eat, drink, and play music locally. The Roundstone Rye we sampled was excellent, lighter than many bourbons, but flavorful and completely smooth at the tail. The highlight of the afternoon was listening to McKnight perform "Letter to Colonel Mosby" while sitting on an oak barrel in front of the still. 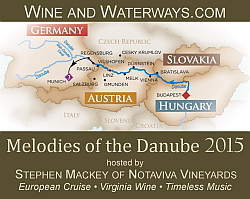 At winecompass.com, we are followers of "Free the Grapes, now it's time to Free the Shine.